The first in-depth study we will present will be the events of the Exodus journey, beginning with the time the multitude leaves Egypt until they cross the Red Sea. A map is attached for reference. We will systematically take each step of their journey. 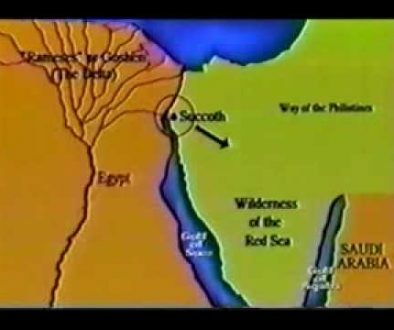 We do not continue their journey once they cross the Red Sea and enter Midian, but we do show on the map the location of Mt. Sinai. As I began to study the Biblical account, in Exodus 3, Moses encounters the burning bush while he is in Midian, tending the flock of Jethro, his father-in-law. There, God tells Moses that he is to bring forth the children of Israel out of Egypt. Moses was told in this verse to bring them back to Midian, to the mountain where God spoke to him. In my studies of ancient Egyptian history, it became clear to me that Midian was not in the Sinai peninsula — that it was in northwestern Saudi Arabia. All through the Sinai peninsula there is tremendous evidence of the ancient Egyptians having control of this area. The inscriptions tell of their mining operations there. There are temples out there as well as fortresses. Had Moses led the people across the Gulf of Suez, they would have still been in Egyptian-controlled territory. But in Saudi Arabia, there is no evidence of Egyptian occupation. In fact, when I showed the archaeologist from Riyadh University the petroglyphs of cows and bulls on the golden calf altar, he was very excited — he said this ancient Egyptian style of petroglyph was found nowhere else in Saudi that he knew of. The horns of the cows and bulls were drawn in the Egyptian style which represented the gods, Hathor and Aphis. With this established, that Mt. Sinai lies in NW Saudi Arabia, and the crossing took place across the Gulf of Aqaba, let’s begin their entire route to the sea. Rameses could not be referring to a city for the simple reason that there just wasn’t a city in ancient Egypt large enough to hold the 2-3 million people Moses led from Egypt, much less all of their flocks and herds. God tells Moses in this verse that on that very day (selfsame day), while they are still in their homes, He will have brought them out of Egypt. This tells us that they left Egypt before sundown the day after the angel of death visited Egypt. * Note that a “day” to the Israelites was not as we think of a day – from midnight to midnight. Instead, it was from evening to evening. 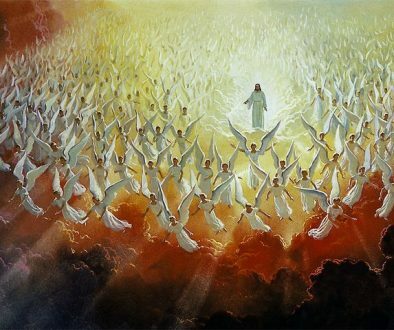 In summary, when word came to the people that they were allowed to leave, just after the “angel of death” visited Egypt, they all left their homes in Rameses, or Goshen, and proceeded to leave Egypt “proper.” How was this possible — that they were able to be out of Egypt so quickly? On the map, you can see that Egypt is extremely long, but its east/west boundaries are very narrow. They left Rameses and assembled in Succoth, which was very near, but at the same time, outside of the boundary of Egypt “proper”. To sum up what he has said, in ancient Egypt, there was a line of guarded fortifications along the canal which connected the Gulf of Suez with the Mediterranean Sea. This canal is known to have existed anciently by satellite photos and infrared photos which still show its path. At the point where one would leave Egypt proper and go into the Sinai desert, there was a fortress and a bridge. Inscriptions tell us that this fortress was called Tharu (or one of the various spellings). This is also located near the Delta, or “Rameses,” where the Israelites were living. “Tharu” was where the Egyptian army assembled in preparation for their military expeditions to the north. Armies consisted of a great deal of men, horses and chariots; and they required a large area to assemble properly. Moses well knew Tharu, called “Succoth” in the Biblical account — and it was here that he organized the people for their journey. They had left Egypt proper once they crossed this line of fortification, just as the Lord had promised. We know of a surety that “harnessed” doesn’t mean “armed with weapons” because they had no weapons until God provided them by washing the bodies of the dead Egyptian army upon the shore after the waters of the Red Sea closed back up. The chariot soldiers had to strap their weapons to their bodies, and when they were washed upon the shore, the multitude simply collected their weaponry. The next stage of a crown prince’s training was military. Moses was thoroughly trained in all aspects of military leadership and would have known well how to assemble large numbers of peoples for travel. While no specifics are given in the Bible as to Moses’ life in Egypt, several ancient historians make reference to the fact that he was a general. And we admit that we do not accept all of what these people have to say as being totally accurate, but the fact that Moses was indeed a general in the Egyptian army seems to have been a well-known fact. Josephus writes about this in his “Antiquities of the Jews,” Book II, Chapter X. As a military man, once again, Moses knew “Tharu”, and it was here that he organized his largest “army” ever for travel. And from here, they travelled to Etham. It was the Wilderness of the Red Sea — the mountainous land of the mid and southern Sinai Peninsula. This was along a route that was commonly taken in those days by both caravans and the army, and it was called “the southern route.” This route was taken because it was safer than travelling along the coast, where the Philistines were. In order for them to be “entangled in the land,” they would have to be travelling through an area of wadis (canyons) with high mountains all around, which would seem to hem them in. This takes place prior to crossing the sea, so I looked for an area such as this which would terminate on a beach or shore of the sea which was large enough to hold perhaps 2 or 3 million people, as well as their flocks. I found a beach of tremendous size on the Gulf of Aqaba at Nuweiba, and the only passage to it is through an 18 mile long wadi system. From “Etham in the edge of the wilderness”, they changed their direction of travel from a northerly direction, (which would have soon taken them around the northern tip of the sea,) and went south, through a wadi system that must have appeared like an endless maze to them. Hemmed in to the left and right, they could only travel in one direction — and the only path through that wadi leads to the tremendous sized beach. When I first visited the site of Nuweiba in 1978, these mountains could be seen on the south end of the beach area which terminated at the sea — no passage would have been possible to the south. (See color photo below of this area, where the mountains meet the sea on the south end.) As I found the chariot parts when diving on the southern end of the beach, this implies that the multitude travelled to this section of the beach. Pharaoh’s army entered from the same wadi, which is the only entrance onto the beach. This wadi is located midway of the beach, and once the army entered the area, the multitude’s only means of escape would have been to the south. But the mountains to the south extend all the way to the sea — they had no way of escape, or so it seemed. When God gave Moses these instructions, it is evident that Moses knew where these places were — he was familiar with the land. On the north end of the beach area, there are the remains of an ancient Egyptian fortress, which would have prevented their going north when they entered the area. 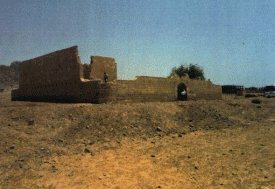 This fortress was another evidence that Egyptian territory extended all the way through the Sinai peninsula. 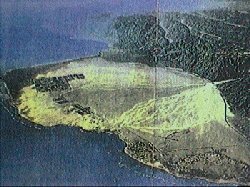 (See color photo of this fortress on the northern end of the beach area.) We believe this was Pihahiroth. As they were in between Migdol and the sea, Migdol could either be the mountains to the west, which make a perfect barrier, enclosing them on the beach — or it may have been a watch-tower which set on top of one of those mountains. We have not climbed all those mountains and searched for one, yet. 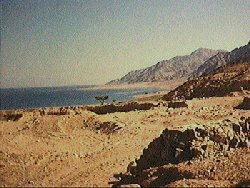 But the Egyptians did have watch-posts all through the Sinai Peninsula, and most likely would have had one here, to keep an eye on ships coming up the Gulf of Aqaba. It is historically documented that they flashed messages from watch-tower to watch-tower using reflected sunlight by day and fire by night. In fact, that may well be how pharaoh knew exactly where Moses and the people had gone. Moses would have most certainly been aware of these watch-towers. The fact is that chariot parts have never been found in the Red Sea anywhere except at this site. The question has been asked: “Isn’t this site for the crossing too far? Wouldn’t it have taken them a long time to get there?” Well, in 1967, Moshe Dyan marched his troops from Nuweiba (the crossing site) to Suez City (near ancient Tharu/Succoth) in six days. And they camped at night. The Israelites were told to use only unleavened bread for seven days – indicating that they would be travelling quite briskly without time to camp for seven days. 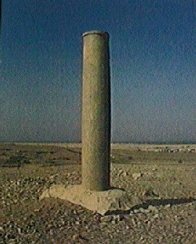 In 1978, when I first visited the beach area with my two sons, we found a Phoenician-style column lying on the southern end of the beach. Partially in the water, the inscriptions had been eroded away, or possibly they were purposefully chiselled away. We found this during the time that Israel was occupying the Sinai, and we pointed it out to the soldiers who were patrolling the beach. The next time we returned, we found they had moved it across the road and set it up in concrete. We didn’t fully understand the importance of this column until a few years later — we did recognize that it was definitely not of Egyptian style. But in 1984, when we were imprisoned in Saudi Arabia, our captors, in an effort to verify our story that we believed Mt. Sinai was there and that “Musa” (Moses) led the people across the sea to their country, had me take them to the beach where they arrived after passing through the sea. I directed them to the spot in a helicopter. Landing here, I found another column — identical to the one on the opposite shore — except this one had the inscriptions intact. Noting carefully the Phoenician (Archaic Hebrew) letters, we were later able to have it translated. 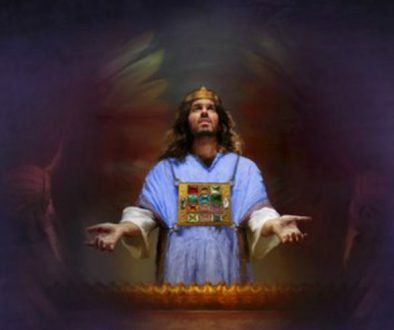 It contained the words: Mizraim (Egypt); Solomon; Edom; death; pharaoh; Moses; and Yahweh. From this, we knew that King Solomon had erected these columns in honor of Yahweh and dedicated them to the miracle of the crossing of the sea. And, that column possibly saved my sons’ and my lives — it proved what I had been telling my Saudi jailers! This year, we discovered that the Saudis have removed the column on their beach from its original location — they have sunk a large marker in concrete where it was located — and we are trying to locate it in their Antiquities files. But we have documented the solitary marker, sunk into the ground in concrete, on the beach, just down from the remains of the ancient fortress we believe was Baalzephon. We will study the sites on the Mt. Sinai side of the gulf later this year. 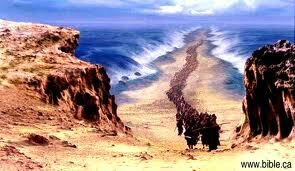 There has been much controversy through the years over “which” Red Sea is being referred to in the Exodus account. You will see here, that “Red Sea” is used to refer to all section of that sea — the main body, the Gulf of Suez and the Gulf of Aqaba. If you will get a large map of Egypt, you will note that the Red Sea is quite large — beginning at Ethiopia on the southwest and Yemen on the southeast. It separates northern Africa from Arabia. At its northern end, it splits into two arms – the Gulf of Suez and the Gulf of Aqaba. Let’s go to the first reference to the Red Sea in the Bible — the plague of the locusts had covered all the land of Egypt. If you go the map, you will see that Egypt extended far south of the Suez arm of the Red Sea. Thebes, the ancient capital of Egypt, lay a good 150 miles south of the beginning of the Gulf of Suez (as the crow flies.) Now, these locusts were in all the “coasts” of Egypt, including Thebes and beyond. This reference is definitively speaking of the Gulf of Aqaba, because we know where Eloth (Eilat) was. And this is the same Red Sea that Moses led the great multitude across. The Red Sea of Moses’ day was the same Red Sea we know today — the main body of the lower Red Sea, the Gulf of Suez and the Gulf of Aqaba. But He does “liveth”, and before it’s all over with, He will vindicate His Word to the world.